Used in factories, warehouses and docks. Made for usage in unusual anchoring conditions. 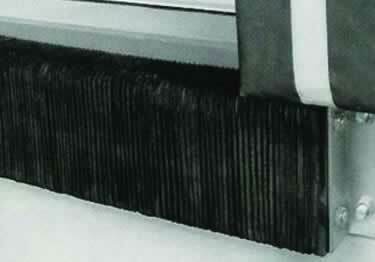 Made from 80% recycled material from fabric reinforced rubber pads cut from selected recycled tires. Made under pressure exceeding 1,500 lbs. to absorb over 80% of impact force. 3' of rubber to prevent damage to the anchor bolts. Chipping and abrasion eliminated by tough piles of truck tire material. Loading Dock Bumper Extra-Length and laminated great choice when you need to prevent loss of refrigeration or warmth from the openings in the dock-seal. These bumpers totally seal the entire length of the dock. The protection is used to stop wind, snow, and rain.